The general public is much more aware of dyslexia and related conditions than they were before the internet became so widely available and it is easy to google dyslexia and find all sorts of checklists and screening suggestions. There is still no totally accepted definitive ‘diagnosis’ of the condition, but anyone who has problems with reading, writing or spelling is eager to find out whether dyslexia explains their issues. A good initial item on the B.D.A. website, Contributary Factors is a good place to start. Traditionally it has been the role of the Educational Psychologist to provide proof that a child or adult has dyslexic learning differences. Especially for the severe dyslexic, this is still the essential route to gain the recognition that provides maximum support in school, college or the workplace. It can take a long time and be costly to follow this route, but there are now on-line and software screening programs that can be used by teachers to obtain some idea of the degree of severity and for milder cases to provide interventions that can provide tools for the dyslexic person to develop strategies to cope with their learning differences. It is important to remember that screening only highlights factors that are likely indicators of dyslexia and should be thought of as signposts to further investigation and not as an irrefutable diagnosis. 3. Teacher-led Individual child and/or student screening. CoPS, LASS, LADS Plus, Lexion, Mystery of Lost Letters. 5. Student and Adult screening. QuickScan, StudyScan, LADS, SPOT, Lucid Exact. 7. A word of caution. Lucid Rapid, and Dyslexia Screener, available as standalone or on-line testing and the screener can come as a paper based pack (Aug 2018). They are relatively quick and easy tests to help the teacher to find the cognitive strengths and weaknesses for each child, the preferred learning styles and to identify any children with more serious problems, who can be followed up with more in-depth screening. There are several checklists on the internet that ‘anxious’ parents may have found for themselves. Some of these are American and not always helpful for our culture, but where a parent brings in the results from an internet search, it can provide a good starting point for home/school discussion and for planning interventions. This self-assessment can be ‘dangerous’, especially for adults if there is no dialogue with professionals to show the way forward, as it can be traumatic to suddenly discover how failure at school might have been avoided. 3. Teacher-led Individual child screening. This is usually undertaken by the SENCo as a result of class screening, where a child is failing to respond to the ‘normal’ learning to read process or there is a request by a parent. This involves more detailed testing by the SENCo who will do the interpretation, but the actual test can be administered by a teaching assistant, who often supervises a follow-up intervention programme. The screening results provide useful evidence to justify a request for a full educational psychologist assessment. 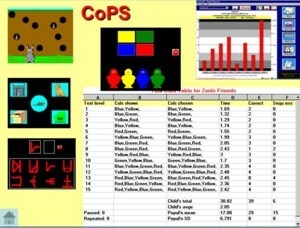 The Lucid programs, CoPS Cognitive Profiling System (KS1), Junior LASS Lucid Assessment System for Schools (KS2), LASS (KS3) and LADS Plus Lucid Adult Dyslexia Screening (KS4+) have been developed over many years in the UK and produce good diagnostic results, with some suggestions for follow-up in the manual, but the teacher has to plan materials for an intervention programme. Screening programs indicating risk of dyslexia. Lexion was developed and has been used in Swedish schools for over 30 years, to investigate the phonological and literacy difficulties that are such an important element of dyslexia and has been translated and normed for use in the UK over the past 20 years. After the test has been completed and analysed, an option is provided for suggested computer exercises relevant to the results. These can be run on the child’s computer through a cut down version of the program, MiniLexion. Screening program indicating risk of dyslexia. The Mystery of the Lost Letters is a Tintin adventure in English, French or German, the responses to which provide a profile of the child. There are also video clips of famous European dyslexics and articles on aspects of dyslexia and its treatment and a link to a website with software suggestions for English, French and German users. Screening program indicating risk of dyslexia. This provides a much more detailed analysis needed especially for those with severe or complex dyslexic learning differences. It used to be a pre-requisite for special arrangements for examinations, but teachers with certain qualifications can now provide these. Assessment for dyslexia. Many F.E. and H.E. colleges use computerised screening packages to help identify those at risk of dyslexia. Quick Scan, takes 10-20 minutes and can be followed by Study Scan if more detailed analysis is needed. Both are published by PICO. LADS+ from Lucid takes about 25-30 minutes and has been developed to provide accurate screening accuracy in wider populations that may include individuals who have non-standard educational backgrounds, low general ability, and/or poor English language skills such as as those studying at college and university. SPOT your Potential is a version of the LADS+ designed to highlight personal strengths as well as indicating if you have dyslexic tendencies. Recently the BDA have worked in partnership with Do-IT Solutions bringing you Screening+ Profiler. Using a suite of tools, it can identify dyslexia-type traits and difficulties and also makes useful suggestions through extensive personalized reports, with links to online resources. It is for individuals 16 years and over, and is good for those in Employment, those seeking Employment, as well as those in Further and Higher Education. Do It also provide the Workplace + Profiler, a modular assessment screening tool that provides analysis and contextualized feedback for employers. Screening programs indicating risk of dyslexia. Lucid Exact is a new literacy assessment for ages 11 to 24 and designed particularly for assessment for access arrangements for examinations. Assessment. Lucid now has an easy-to-use computerised Visual Stress Screener to help in the objective identification of people (ages 7 to adult) who are susceptible to visual stress when reading. Visual stress, which affects 15 to 20% of the population, can affect children’s literacy development and is a barrier to efficient and enjoyable reading. Developed over several years of research, Lucid ViSS gives an accurate and reliable indication of the existence and severity of visual stress and predicts those who should benefit from using coloured overlays or tinted lenses to combat the symptoms of visual stress. Screening programs. It can be life-changing and even disturbing to discover that you or a family member has dyslexic learning differences, so it is important that you discuss this discovery with professionals who can reassure you and/or point out the way forward. It is also wise to have a healthy scepticism of screenings by commercial companies that suggest their expensive product is the only solution. There is no ‘magic cure’ for dyslexia, only strategies that can help you get round the issues! If you have queries or worries raised through taking this or other tests, you can contact the B.D.A. Helpline 0845 251 9002 during office hours. © B.D.A. New Technologies Committee. October 2016.